Toko Merah or Red Store is located in the Jl. Kali Besar Barat No. 7, Jakarta Barat/West Jakarta. 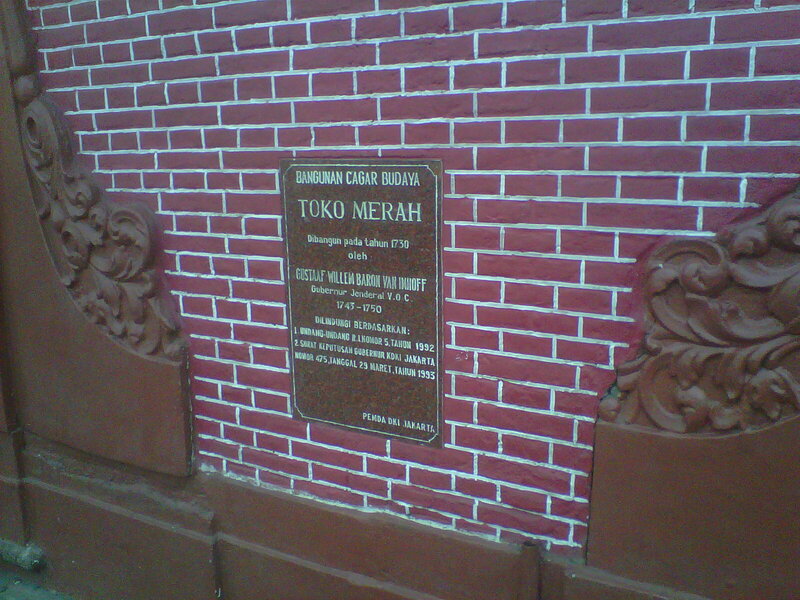 Toko Merah is located rights before the Kali Besar (Great River). Red Store was built in 1730 by Willem Baron van Imhoff Gustaaf (later to become governor-general) as a dwelling house. The name “Red Store” is based on the color of the front wall of the building red heart painted directly on the surface of the bricks were not plastered. Maroon color also appears on the interior of the building is mostly red with a fine-carvings are also colored red. In addition, the land certificate No.. 957, no. 958 dated July 13, 1920 stated that the building was belonged to NV Bouwmaatschapij “Red Store”. Red Stores Building is built on an area of 2455 m2 that consists of three buildings together. Red shop building has many rooms, either on the ground floor, second floor and third floor. In addition to great room (hall) on the ground floor and second floor, other spaces serve as rooms. On the ground floor there is a 16 bedroom, 8 pieces each in the north and 8 pieces in the south. On the second floor there are 4 rooms in the back of the building. While at level 3, there are 5 rooms. Additional buildings in the rear area have a number of rooms. Thirteen years after its establishment, the northern part of the building was once used for college and dorm of the Dutch Maritime Academy which was inaugurated on December 7, 1743. The school is intended to create good marine officers in the field of shipping. The school lasted until 1755.